I recently renewed my friendship with my college roommate and his wife, fellow physics students, at a Reed College reunion. 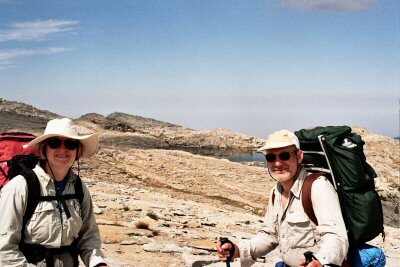 I discovered Wes and Ellen still like to hike, and that they had never explored the Sierra Nevada mountains. Better yet, they are retired and have the time to do things like this. We made plans to hike together sometime, and then my employer asked if I could go to San Jose for a couple of days in the beginning of August. You Bet ! Wes and Ellen graciously agreed to rendezvous at the Fresno Airport, where I would drive to from San Jose when my work was over. 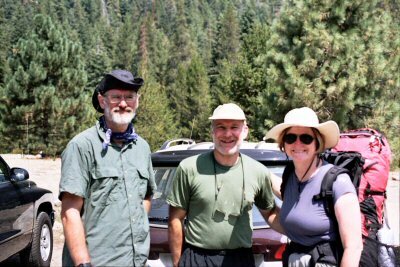 They would spend a few days before the hike getting acclimated, seeing the tourist sights like the Giant Sequoias, and would be on hand to pick up the wilderness permit before picking me up, so we could hike in the first day. You can browse a complete collection of pictures by: Charlie and Wes. We got to Lodgepole late in the afternoon, with plenty of daylight left to hike in a few miles. We had a pleasant dinner at a picnic table near the Lodgepole campground, then eagerly headed up the trail. 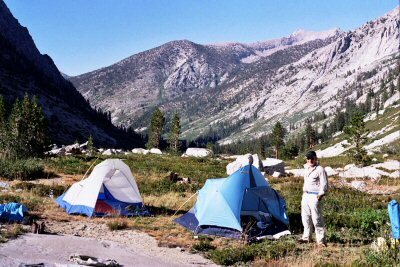 Our objective was to get as far as practical, get off the trail a healthy distance, and find a place to camp. Although we were thinking of stopping at Willow Meadow, we were still feeling energetic enough to go on to where the trail crosses Silliman Creek. There we found a lovely spot out of sight of the trail and made our first camp. 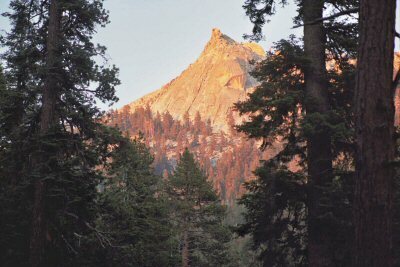 The views at sunset throughout the trip were marvelous, starting with this spire just to the west of Mt. Silliman. This very morning I had been staying in a first class hotel, giving a technical talk to hundreds of people, and acting like a respectable grown up. Now I was in the mountains. It did not take long to get into the right frame of mind. 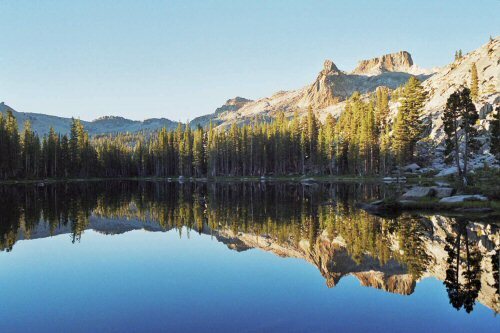 Our first full day of hiking would take us past Twin Lakes, up and over Silliman Pass, and down to Ranger Lake. 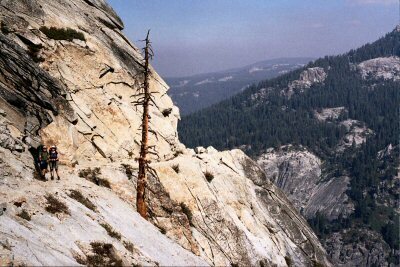 The trail climbs from 7,800 feet to over 10,000 feet at the pass, and then down again to 9,100. For the first day, with a full 10 days of food in the pack, this was plenty. The first thing we noticed was a profusion of bear droppings. Luckily, there was no bear in sight. The trail is pleasantly shaded to Twin Lakes, where we stopped and had lunch. We saw surprisingly few hikers on the trail. There was a group of climbers on one of the Twin Peaks, rapelling down from the top. 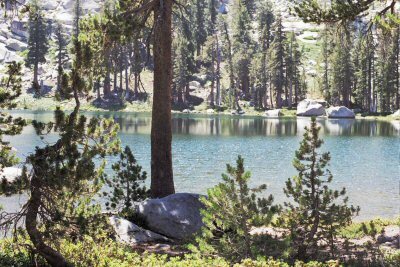 We pushed on to Ranger Lake, where we found one other party camped. We continued to the far end of the lake (where the best campsite is located). Everyone is pretty tired. I had told Wes and Ellen of the exceptional beauty of the lake and its reflections, but a steady wind all afternoon and evening spoiled all that. The next morning, though, the air was calm and the sun shone on Mt. Silliman, and the view was a glorious as ever. 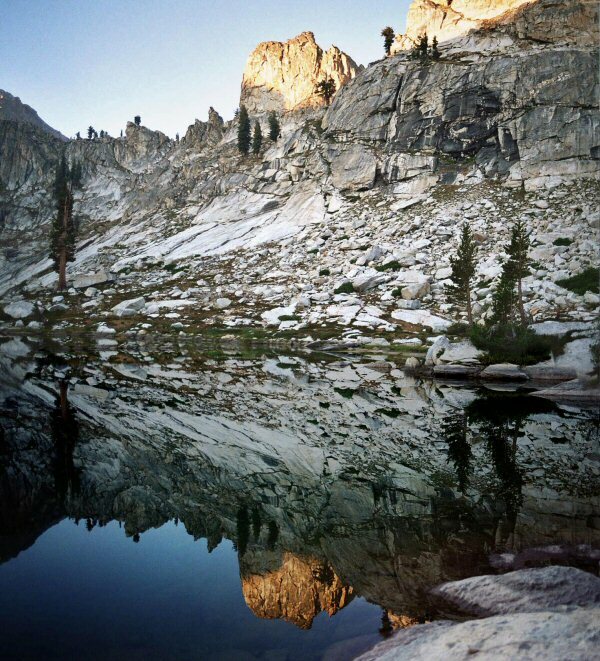 I believe that Ranger Lake is one of the prettiest places I have been in the Sierras. We were planning on climbing Mt. Silliman on our last day, ten days hence. We all took a good look at it. 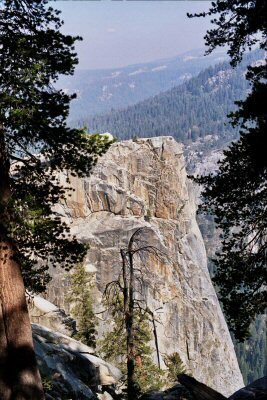 It was very sobering, seeing the sheer cliffs and knowing how much climbing it would take to get to the top. This would be the longest hiking day of the trip. I don't know what I was thinking when I planned it, because it was too much -- far too much. The map said only 8 miles, but the signs indicated it was much farther. 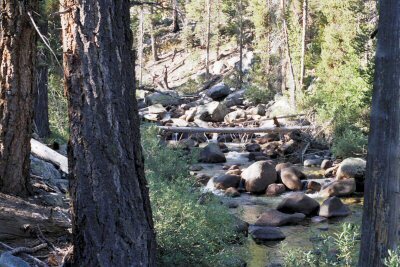 After we had hiked quite a ways, one sign said four miles back to Ranger Lake and ten to Roaring River. When we got to Roaring river, it said eleven to Ranger Lake. 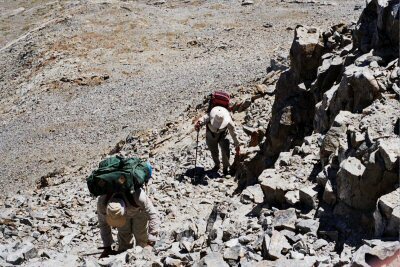 In any case, it was more than eight miles, and the last few miles, where we had to climb steeply, were particularly challenging. We had lunch where the trail crosses Sugarloaf Creek. The water as lower than I had ever seen it. What usually required wading was a simple rock-hop. The trail to this point had been nicely shaded, but was getting sunnier and hotter all the time. We pushed on, passing only a few other parties and arriving at 3:00 PM, after hiking eight hours. Only two days, and we were halfway around the circle, and were exhausted. On checking the trail register, I see a familiar name: Bill Finch. He passed by a few weeks ago. Roaring River campground has a few numbered sites, which were all full. We had to search a while to find a suitable place to set up our camp. As soon as we did, we all lay down to nap. 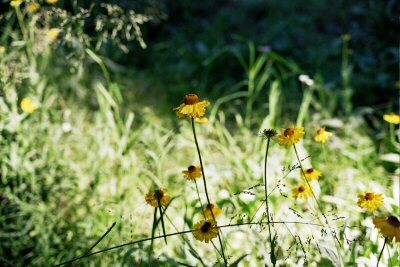 I began to think that my itinerary, which called for us to climb Mt. Brewer on the way up Cloud Canyon, was way too ambitious. Looking up toward Moraine Ridge confirmed that tomorrow would be another challenging day, followed by several more hard hikes. I discussed the idea of skipping Mt. Brewer with Wes and Ellen, who were receptive to the idea of taking two moderate days to get to Glacier Lake instead of three hard ones. So that became the new plan. My own physical condition was favorable. I am not in particularly good shape, being about 30 pounds over my ideal weight. Also I was not nearly ruthless planning the food, taking far too much. It was embarassing that I had two Garcia Bear Cannisters packed with food, plus a stuff sack left over. wes and ellen had one Bear Keg between them (plus a little left over). How could two people eat half what I needed ? Answer -- I didn't need that much food. I think my pack weighed twice as much as either of theirs too. When I weighed it at home it was 65 pounds, but that was before everything was in it. I should really do something about that. Even so, I was experiencing far fewer of the distressing symptoms of altitude sickness than normal. I was able to sleep soundly from the first night on, I had no headaches or agitation, things were great ! Perhaps it was that I had been in California for a few days already. Normally I am coping with (1) a full day of air travel, (2) three hours of jet lag, and (3) the altitude. With the malaise of the travel out of the way, I felt a lot better. The only worry was a blister developing on my right heel. The left one actually hurt more, but I could see a blister developing on the right. I hoped it was because of the gruelling distance we had covered the previous day. The trail up Cloud Canyon is so beautiful. 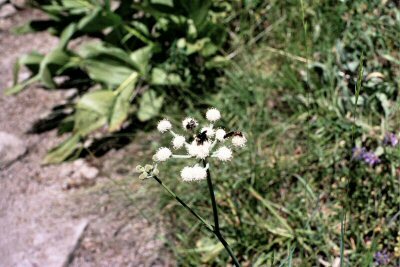 It climbs moderately in most places, passing numerous stock fences, meadows, and camping spots. The creek is always nearby. We stopped at Cement Table meadow to have lunch. While we were there we met a dayhiker, headed up from Roaring river to Colby Pass and back. We had a nice chat, in which he told us this was his 73rd birthday, and that he was training to compete in the Hard Rock 100 mile race. With that encouragement, we put the thoughts of our own sore feet aside. Roaring River had a helthy amount of water, more than Sugarloaf Creek, but less than I am used to. The meadows were dry, which made hiking easier. Many of the meadows were still green, but some (like Big Wet Meadow) were turning brown. Even though the air was pleasantly cool in the shade, the sun was merciless. We huried through the sunny spots to get back in the shade, because it was so hot in the sun. The tributaries feeding Cloud Creek -- Brewer, Cunningham, table, Colby, were all running, at least a little. As we ascended, the main creek became more and more modest, but never gave out entirely. That's Wes up ahead. Wes and Ellen generally hiked faster than I did, but they always thoughtfully stopped to let me catch up. I tried to avoid being rushed, but even if I had wanted to it would have been almost impossible for me to keep pace with them. We passed the Colby Pass trail turnoff, continuing up Cloud Canyon. Since it was still very hot in the sun, we were looking for a shady spot to make camp. Although there were a few stands of trees, we did not find any flat spots among them, and so we pushed on higher and camped just above the tree line. I put my tent up as a sun shade, so that I could lay down and get some rest. I took the tent down after dinner. I much prefer to sleep under the stars when possible. So often there are mosquitos, the threat of rain, or some other reason to hide in the tent. Besides, not having to fold up the tent makes my getaway the next morning all that much quicker. We passed a trail crew camp. It was apparently their day off. 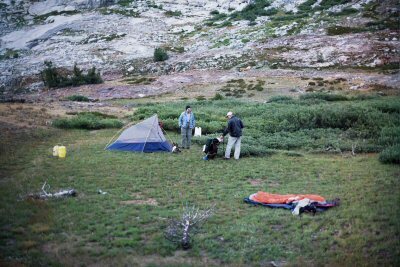 A few of the crew were lounging around camp, some were up higher in Cloud Canyon, and two had headed for Triple Divide Peak. We met these two, on their way down. They had attempted the west ridge, but found it dificult going and had given up. I don't blame them. 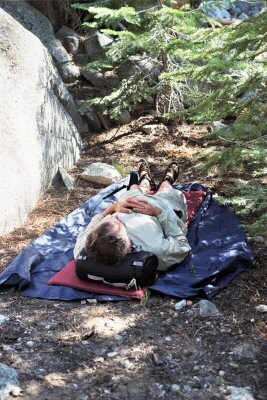 We got started as early as possible, to take advantage of the shade provided by the steep canyon walls. We made it up to where the climbing becomes really steep before we had to deal with the full sun. This is the last point at which there is a good spot to camp, with water, in Cloud Canyon. The miners used this location for one of their camps, as evidenced by various scraps of metal and debris. There is a section of red rock amongst the granite, and on this soil the trees grow. An old miners' trail switchbacks up through the trees, and heads up to Coppermine Pass from the miners' camp. We wanted to go to the other side of the canyon, to Glacier Lake. So we headed up a series of cracks and slabs on the east side of the canyon. After ascending through some cliffs we spotted a moraine, which we climbed to. From below it looks impressive, like maybe Glacier Lake is just behind it. But once we got to it, there wasn't much but one ridge after another. Each time we climbed a higher ridge, more were revealed. At least the footing was sound and there were few gullies we had to descend. We just kept going up and up, until finally we reached Glacier Lake. It was shortly after noon, but it seemed like a long day. Glacier Lake, which has the coldest water I know of, was still surrounded by a few snow fields. 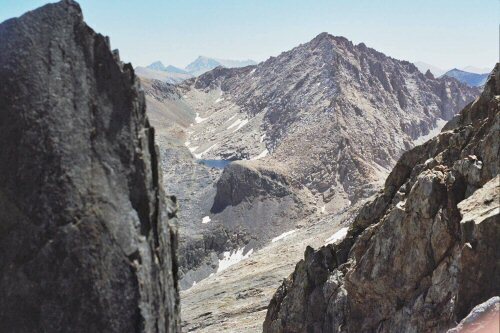 Situated at the foot of Triple Divide Peak, in a band of black rock, it is an austere and slightly menacing place. 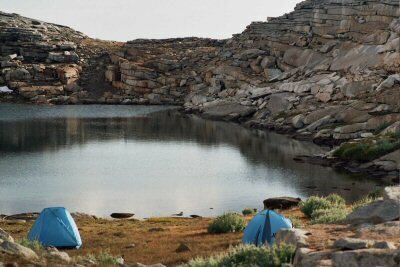 The best campsite is on a small ledge beside the lake, just wide enough for a tent. Again I set up my tent for the shade, but I had to take it down to have enough space to cook dinner. Wes and Ellen set their tent up in the only other flat spot around. We all crawled into our tents as soon as we arrived and did not come out until 4:00. 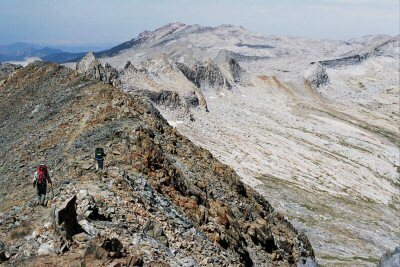 In the background, where the white and black rock meet, is the climbing route up Triple Divide Peak. It climbs to the ridge, then goes right on the ridge up to the peak. 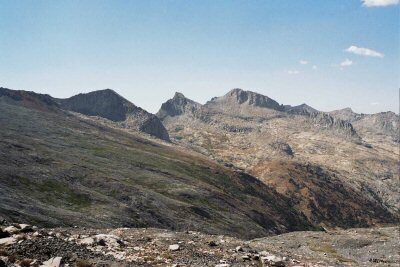 Wes and Ellen had no desire to climb the peak, so we again decided to skip the ascent and move on toward Coppermine Pass the next day. 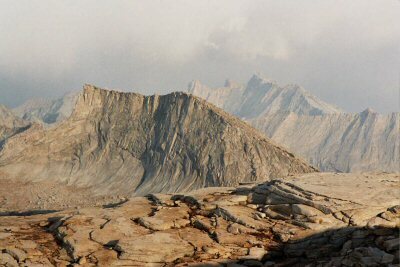 This is the view from Glacier Lake, across the upper end of Cloud Canyon, toward the west. The section of red rock, with trees, is visible on the right. Most of the skyline is Glacier Ridge, separating Cloud Canyon from Deadman Canyon. 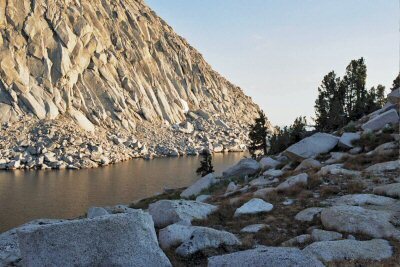 On the left, the ridge separates Cloud Canyon from Lion Lake (the Kings-Kaweah Divide). An informal miners' trail makes its way up through the trees, across the slopes, and over the Lion Lake section of the ridge. 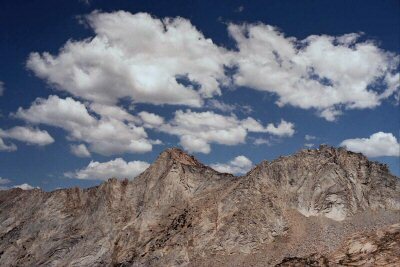 It is difficult, from the Cloud Canyon side, to see where the Kings-Kaweah Divide ends and Glacier Ridge begins. The instructions on it in the guidebooks are not clear. 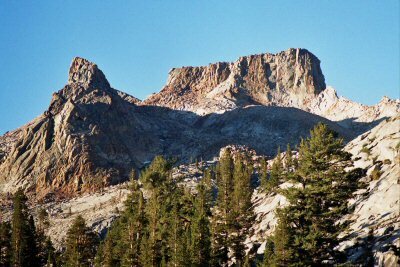 For instance, from Secor: "The path crosses Glacier Ridge just north of the divide that separates the Kings River watershed from the Kaweah River. This is a steep and difficult route ..." This is inaccurate: the path does not cross Glacier Ridge, but bypasses it on the south slopes of the Kings-Kaweah Divide (as shown on the map). I have been over Coppermine Pass several times over the years. Most of the time I have approached from the west, where the route from the copper mine is clear. Of the times I have climbed east to west, in every instance but once I have either followed the miners' trail from its beginning in Cloud Canyon, or have come through from the west and then retraced my steps. The one time I crossed from Glacier Lake directly, I located the miners' path, but then lost it under extensive snow fields, and wound up climbing the wrong place. Determined not to make the same mistake again, I confidently identified the wrong notch and assured Wes and Ellen we would only climb to the ridge once we were on the miners' path. For good measure, I had created a GPS waypoint from the maps at the location of the pass. We searched back and forth for the miners' path, but cound not find it. The GPS was leading us right to it, however, so I continued on higher and higher hoping to find the path eventually. I finally got to the ridge, exactly at the waypoint, but alas it had steep cliffs on the other side, and was not the pass I was looking for. I explored along the ridge, left and right, looking for the pass, but I could never find it. 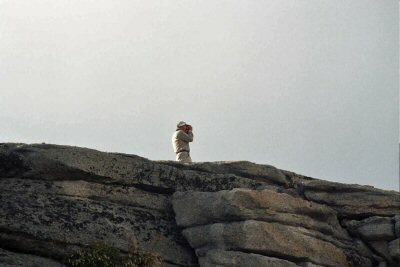 Meanwhile Wes and Ellen had ascended to ridge, took a good look at the cliffs on the other side, and wanted to get down. I convinced them that we should go down and look some more, which they reluctantly agreed to do. We crossed the head of the canyon to below the wrong notch, which I knew to be too far, and never found the path. I was mystified -- where could the pass be ? 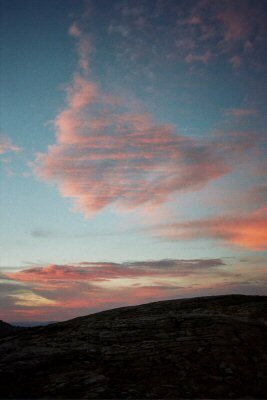 In the face of this uncertainty, we decided to return to Cloud Canyon, spend the night at the miners' camp, and hike back down and up Deadman Canyon. While we were descending, we came across the path, but at that point we decided to continue down. The path turned out to be well marked with cairns, and we had no trouble following it the rest of the way to the miners' camp below. We stayed at the miners' camp, which was especially comfortable. Overnight I pondered what to do next. I did not relish the thought of hiking all the way back to Roaring River, then all the way back up to Elizabeth Pass. We were almost there ! 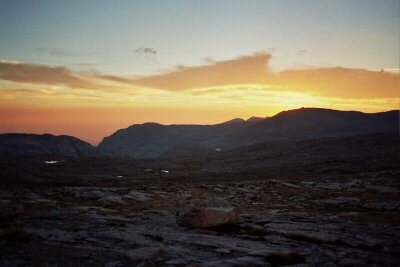 In the morning I proposed that Wes and Ellen stay in camp, while I followed the miners' path back up top the pass. If I still could not locate the pass, then we would descend as planned. If I could find the pass, then we could consider our options then. The next morning I followed the path up through the trees, across the slopes, seemingly to where we had been the day before. I made sure to stay on the path, and sure enough it led right up to the pass. It was just a little to the right of where we had climbed before, just where I knew "it had to be" but could not find it. I checked the GPS, and it told me I was 0.2 miles away from the position of the pass. In fact, it still said it was where I climbed the day before. I took a waypoint at the "real" pass and plotted it on a map, shown below. On the first try, I reached the ridge at the waypoint "COPPER". The real pass was almost 700 feet to the northwest, at the waypoint "REAL PASS". The map shows the pass, and although it is not clear exactly where they meant it to be, it is apparently closer to where the real pass is located than where I originally put the waypoint. For future reference, the pass is as UTM 11S 0361146E 4051346N. What happened was that I created a waypoint using the map at what I thought was the correct spot of the pass, and I followed this waypoint as if it were authoritative, winding up in the wrong spot. I knew it "looked wrong" but my trust in the GPS led me to follow it up anyway. In fact I had not marked the correct spot, so the GPS became a hinderance rather than a help. The lesson is to remember that a waypoint is only a guess derived from the map map alone, and once you have the map and are standing on the terrain itself, you have much more information to go by. After finding the real pass I descended and conferenced with Wes and Ellen. We decided to give the pass another try the next day. We spent the rest of the afternoon lounging in the shade. It was especially pleasant to take a break from all the strenuous travel. The next day we again followed the trail up to the pass. The last few hundred feet beneath the pass are very steep. Although there are switchbacks, they are collapsed in one place, and a little class 2 scrambling is required. The view from Coppermine Pass is spectacular. 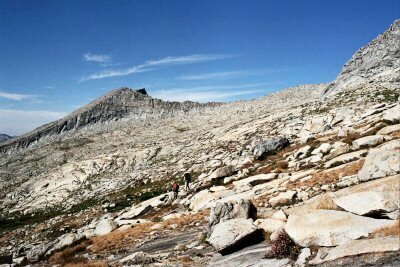 The northern slopes of Triple Divide peak, its three ridges, and the upper parts of Cloud Canyon are all laid out below. On the other side, Lion Lake, Tamrack Lake, and the Kaweahs Beyond all stand out sharply. Wes had warned me that he was uncomfortable with too much "exposure" but I have to admit I did not understand exactly what this meant. It turns out that Coppermine Pass and the route from it to the copper mine is what he was talking about. I am afraid he did not enjoy it at all. I know for myself there is a point, near the top of a cliff, where I will go no closer. I guess he was experiencing the same thing all the way from the pass to the mine. Seeing this reaction, I knew it was a good thing we did not attempt to climb Triple Divide Peak, because climbing the ridge is much the same, even more. As we crossed over Deadman Canyon, the clouds started to build up, for the first time on the trip. The sun was so brutally hot that I secretly welcomed clouds, although I knew they would probably continue to build until we had rain. As we crossed the Elizabeth Pass trail, we all had has a discussion of whether to continue cross country or return via the trail. The route so far had been both more exposed and more strenuous than Wes and Ellen could enjoy. The Elizabeth Pass trail was going to be our last chance. I promised them that the way ahead would not be as bad as what they had just been through. 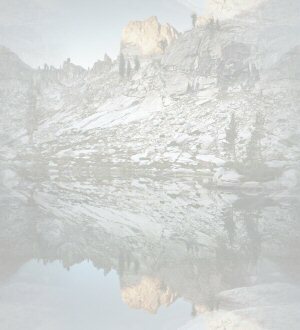 Although they both eyed the Lonely Lake pass suspiciously, they agreed to give it a try. 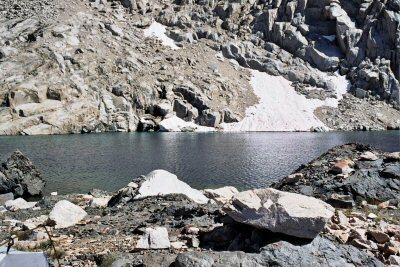 After crossing into the basin of Lonely Lake, we quickly got off the slabs and onto the gentler slopes to the north. 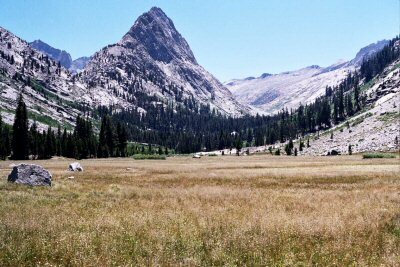 The little string of lakes and meadows were mostly dry or nearly so, but a few of the larger ones were still attractive. We stopped for the night at one of them, a little above Lonely Lake itself. A little while later, a party of four came up from the Tablelands, looking for Lonely Lake. When I told them it was just below, they were quite relieved, and hurried off to it. 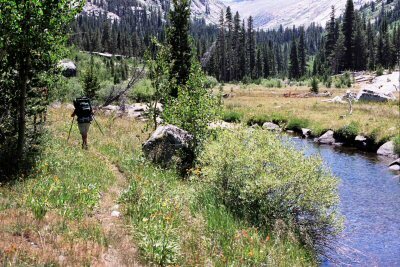 We did not see or hear them again until the next morning, when we saw them crossing Lonely Lake pass into Deadman Canyon. I began to realize that as my pack weight was decreasing, I had less and less trouble keeping up with the others. In fact I occasionally had the opposite problem, pushing on too far or too fast when the others needed to rest. I reminded myself not to hurry, to let Wes and Ellen enjoy the opportunity to explore the way to go. As we headed from Lonely Lake towards Pteradactyl Pass Wes spotted a buck below. We watched it spring effortlessly from rock to rock, in contrast to our painful crawl. I was relieved that the cross-country travel became easier as we approached the tablelands, and that we could stay a safe distance from high cliffs. 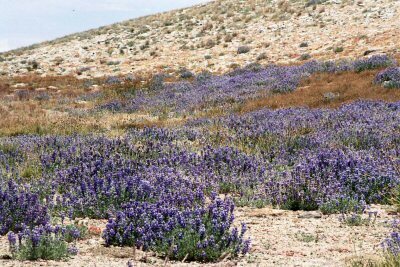 We crossed along the Kern-Kaweah Divide, past many kinds of flowers blooming in profusion. The clouds kept building during the day, so that when we arrived at Upper Big Bird Lake it looked like it was raining back in Cloud Canyon and Sugraloaf. For the first time I set up my tent with the rainfly, just in case. As the clouds continued to thicken, we could hear thunder from the north. We decided to cook dinner early. Sure enough, just as we were finishing and rinsing out the dishes, the rain started, quickly turning to hail, then back to rain. It continued for an hour or so, then let up. Thunder and lightning continued in the north and east for a while longer, but the sky above us cleared up. The area around Upper Big Bird Lake has great views all around. Both Wes and I took the opportunity to photograph storm clouds, flowers, and the sunset. Before the rain we met a party of hikers climbing up from Big Bird Lake. 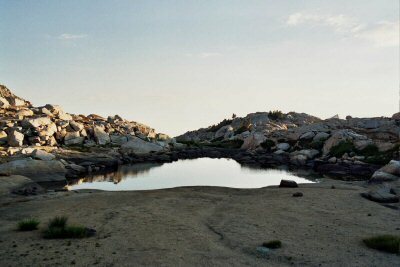 Instead of climbing up the lakes at the south end, another group of hikers had convinced them to climb via the lakes to the northwest. These turned out to be much more difficult than they were prepared for, so they were arriving at the crest late in the afternoon. Despite their experience, they asked me for directions to Pear Lake, which I gave them. Off they went. I hope they made it a ways before the storm hit. The golden sky, highlighting the swirling clouds made everything seem dramatic. The next morning, the storm clouds to the east were replaced by smoke clouds. There was a strong scent of smoke in the air at daybreak, although it dissipated (more or less) as the day went on. There are various ways to go across the Tablelands back to Pear Lake. I let Wes and Ellen choose a route, avoiding the descent into Table Meadows and the steep descent into Buck Canyon. We came across a park service experiment, consisting of several wire cages stuck in the shallows of a lake in the Tablelands. There was a card describing the experiment, but I neglected to copy down the explanation. We had lunch on the shores of a beautiful pair of lakes northwest of Moose Lake, then started the serious descent. 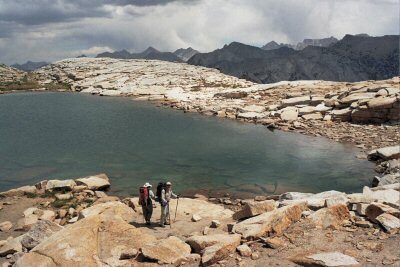 We arrive at Pear Lake shortly after noon, after a steep descent on the rocks. I think Wes and Ellen were relieved to get back to a trail. No one else was present, so we had our pick of campsites. 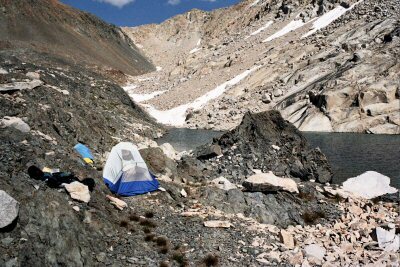 We chose a relatively secluded spot up on the rocks across the stream from most of the campsites. Throughout the day several parties arrived, so that by evening about half the campsites were occupied. There were people swimming, fishing, swordfighting with tent poles, and the usual clamor of campers. We had camped by ourselves since Roaring River, six days before. The clouds again threatened during the afternoon, but if they produced rain it was to the east of us. By the evening the clouds were again beginning to clear. Again the day started out with the distinct smell of smoke, although this time we could not see anything distinct. Was tht haze in the distance smoke from a forest fire, or smog from Fresno ? The Pear Lake trail is quite spectacular, with parts of it carved out of the cliffs. I mentioned to Wes that there was an alternate route that avoided the cliffs, but he opted for the more scenic route. Here Wes and Ellen are crossing one of the more spectacular cliffs. The series of cliffs comes to an end with the biggest of all, the Watchtower. The trail skirts along the top of it, but does not go out on it. We stoppped to admore the view for a few minnutes, then hurried on. 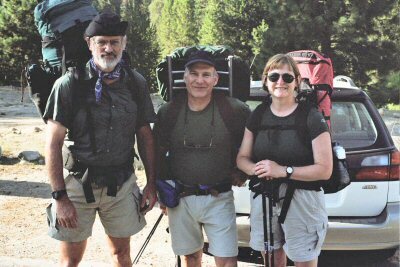 We were hoping to find a ride from the Wolverton trailhead back to Lodgepole, saving a couple of miles of walking. We passed dozens of parties heading up the trail, Only one lone hiker was heading down, and he passed us quite early on. As soon as we got to the trailhead, we set up near the parking lot entrance to try to snag someone going to Lodgepole. It only took about one minute before a car pulled up. It was the hiker that had passed us that morning. He graciously offered to drive us all to Lodgepole. This ended the trip on a positive note. As before with the altimiter, I learned a lesson about relying on technology rathen then on more basic navigation skills. Knowing that I had an "infallible" navigation tool in the GPS let me relax instead of studying the map and concentrate on where I needed to go. The crippling part about technology is that its mere presence does the damage, even if you do not use it. I have been using the GPS in the Catskills, where the forests limit visibility so you cannot navigate as well by sight. Tlthough the GPS has its own problems in the forst (you cannot always get a fix), it still is much easier than map and compass. I am not convinced that the same applies in the Sierras above treeline. Since the maps and guidebooks rarely have exact coordinates , waypoints will always be a guess, and probably less accurate than one made when you are actually there. The other lesson, one I have also observed before, is not to rush to make changes in plans. When something goes wrong, it always seems like I need to think for about one minute, and then decide what to do next. There is rarely a need to hurry. It would often be better to think for an hour. After that time I would be rested, less frustrated, and would have had time to consider all options. When I think of the times that I have gotten into the most trouble, it is always after changing plans on the spur of the moment, only to get into worse trouble. In this case, I believe the decision to abandon looking for the miners' path was premature. The drive to descend was drivem partly out of frustration and partly out of exhaustion. Both would have been alleviated with an hour's rest. We would still have had plenty of time, either to continue over the pass or descend, after resting. Because the summer was very dry to start with, and because we were starting in August rather than July, I had expected to see relatively few wildflowers. I war wrong -- there were flowers all over the place, but especially at the higher elevations. After the rain at Upper Big Bird Lake, the setting sun lit up the remaining clouds. I sat and watched as the sky changed color again and again.